Community Garage Sales in Winnipeg (and surroundings) for 2018! If you love Garage Sales, then you’re probably counting the days until all of the big Community Sales! If you’re new to them, it’s a great way to hit up a lot of sales in one area super quickly! There’s often a lot more happening too, like food trucks and special events. Remember to obey parking laws, be respectful of people’s property etc. It makes for a very busy day, so plan accordingly for it. I will keep updating the list as we go, so if I missed any let me know so I can add yours in! 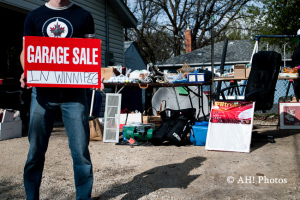 Whyte Ridge is having their Mother’s Day garage sale as usual – it’s on May 12th and most sales start at 8am. Sage Creek is having their sale on May 26th from 8am until noon. Island Lakes Sale is on Sept. 8th from 8am to 2pm. Elie and surrounding area does theirs on May 12th from 9-2. River Park South is having their sale on Saturday June 2nd. I’m having one on May 26 and 27th. At Ecole Julie Riel school, 316 Ashworth St. All processes will be going to the MS Society. Normnand park garage sale is always the first Saturday in June. Can you please add that one. Saw that Bridgewater Forest is May 26! Niceville has their community wide garage sale in the beginning of May. River Park South community garage sale is Saturday, June 2 from 9 a.m. to 3 p.m. Huge charity garage sale this weekend with all proceeds going to CancerCare Manitoba! Over a dozen families have donated items! 70 Woodgreen Place in St. James. Friday, May 11, 4-8 p.m., Saturday, May 12, 9 a.m.-4 p.m. LOTS of toys, baby items, books and clothes. Large variety of household items including kitchen wares, home decor, small appliances. Outdoor toys, bikes, tools, electronics, sports gear, and much much more! Come out and find some treasures while supporting a great cause! May 26 St. Francois Xavier town wide garage sale. Does anyone know about the island lake one yet? Island Lakes is by far the largest most attended community garage sale. The second saturday in September every year!